Like all good stories, this one starts with me up too early walking my dog. This morning, just before dawn, I spotted my first meteor. Having seen this picture posted quite a few times on Facebook, many blogs, and websites, I thought I'd join in. I was walking East toward the Beach. Looking up to the crescent moon, spotting Jupiter above, Venus below, I looked to the right. Toward the South I saw a dash of light arc across the sky as a meteor burned itself out in the atmosphere. Who knows if it really is one of those meteors, all I know is I saw something that wasn't an airplane coming into land at Ft Lauderdale Airport. 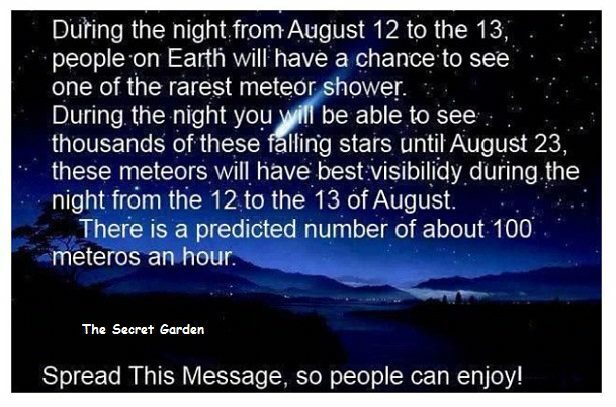 Even here where on an average night it looks like there are twelve stars and the moon, you can see the meteors flashing in the skies coming in for a visit. 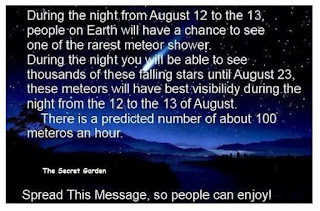 If you want to read more about the Perseid Meteor Shower, Click here. So grab your loved one and get some well needed exercise, and make a wish for me too. They really are quite pretty. Altoids Tin For Your Next Wallet? Sorry Microsoft, Can I Have The Old Hotmail Back?